Flexible, fun and fit for industry. Jack Soward loves sport, so it’s no surprise he needed a degree that let him jump right into the sporting industry. 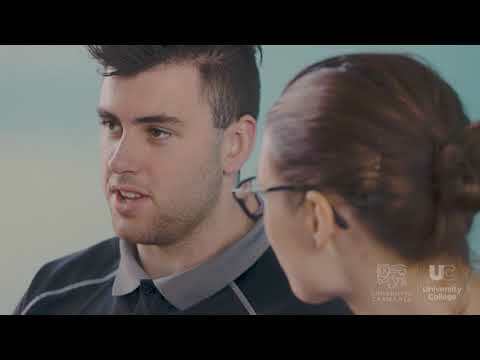 Jack is studying the University of Tasmania’s Associate Degree in Applied Business (Sport, Recreation and Leisure Specialisation) with the University College. At the same time, he’s working as Commercial Operations Assistant at Melbourne United Basketball Club. For a while Jack studied to become a teacher, but he found that wasn’t quite right for him. He saw the associate degree, and when he realised it would allow him to study sport, he was hooked. Because Jack is already working in the industry, he’s continuing to develop his skills –just when he needs them the most. “The best thing about working in the industry is that it’s still progressing my associate degree. I think it was in the third week I actually had a direct crossover with something I was doing at work and I ended up doing an assignment on that the next week, so that’s pretty cool. “I firmly believe I wouldn’t have lasted two days in Melbourne if I hadn’t done this degree,” he said. And while juggling work and study can be tricky, Jack is making it work. “I’ll be on the train to work trying to get through an assignment or on the way back from work, I’ll be home and get straight into it. Jack said anyone looking for a flexible course that will give them the skills to go right into industry should think about an associate degree. “Through our workshops we had simulation job interviews, simulation contract meetings, and a lot of realistic exercises that were really good,” he said. Everyone learns very differently but a lot of people that have done the degree with myself have said they love being able to read something but then instantly put it into a real scenario. While Jack has enough on his plate right now with bouncing from work to study, he’s already thinking about his future. Find out more about the Associate Degree in Applied Business here. The Associate Degree in Applied Business has opened new doors for James. It's “enlightening, relevant,” and “hands-on”.